Father’s Day 2013 is Around the Corner! Fathers are extremely important members of the family, and because they are, giving them something special to celebrate Father’s Day is just one way we have of telling them thanks for all they do. Here are some great gift options you should take into consideration when looking for something great to give to this special man. Walking On A Cloud’s BIG Father’s Day SALE Event is on with great fashion and with exceptional comfort. Don’t miss this great event and buy the best shoe for your loving Dad,each steps he walks ahead makes him remember you. These are a very comfortable and classic shoe that can be worn every day. They have a masculine design, and are partially lined with leather to make them breathable and moisture-absorbent. The unique Comfort Fiber System of ECCO increases the amount of air flow in these shoes to create a naturally cool environment to help maintain healthy feet. The flexible polyurethane sole adds to the comfort enough to wear even when your man is walking long distances.Walking On A Cloud is giving all its customers a special father’s day deal for Ecco Remote Lace Navajo by reducing $50.00 from it’s original price. These sandals are just what any man can be proud to wear. They are made from synthetic leather with a meshupper, and the Lycra neoprene lining offers an environment that is free of abrasion so that he can wear them anywhere. This lining features the benefits of Aegis, an antimicrobial solution that will help keep his feet cool and dry during the day. The air cushion in the heel make these shoes both stable and shock absorbent, and they are easy to get the right fit with the adjustable Velcro straps. This vegan friendly footwear has a non-marking sole and is water friendly. Walking On A Cloud is giving all its customers a special father’s day deal for Merrell Cambrian Strap Brown by reducing $25.00 from it’s original price. Portland is a city that people love to tour. This shoe was inspired by the notion that one should be able to do as much walking as they want without feeling the pinch or discomfort of a shoe. The supple, full grain of the Nubuck leather uppers will not bind or pinch, and they never require breaking in. cushioning is provided by the lightweight EVA molded insoles which adds to this being a shoe for all occasions. The fully padded collar and tongue are an excellent addition, and the soft Ortholite footbed creates all-day comfort. This is a flexible shoe for the man you love. You can get these for him in Brown or Black. Walking On A Cloud is giving all its customers a special father’s day deal for Clarks Portlant Brown by reducing $50.00 from it’s original price. 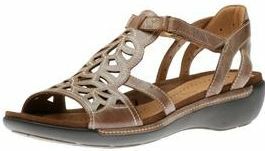 These are Rockport sandals that are comfortable and stylish with its contrasting stitching and leather and mesh uppers. The padded collar is made to prevent blisters from forming, and the moisture wicking lining will help to keep his feet cool and dry. The EVA footbed adds comfort and support which is something he will love. Add to that the easy adjustment that comes with Velcro straps and the rubber outsole that absorbs shocks and adds durability and you have a gift that he will not be able to resist. Walking On A Cloud is giving all its customers a special father’s day deal for Rockport Cc 3 Strap Brown by reducing $20.00 from it’s original price. Every man enjoys the look and feel of a comfortable canvas walking shoe, and that is what he will get from this one from Merrell. The full grain leather combined with canvas for the upper adds comfort and style. The twill lining is treated to resist odor with Aegis, which is an antimicrobial solution. Along with that, he will enjoy the benefits of the EVA removable footbed which increases the support and comfort. The lace up closure offers security as well as a comfortable fit. The Merrell Rant Sole provides shock absorbency with non-slip security. The air cushion that is embedded in the heel provides the stability he wants, and the EVA midsole adds to the cushioning. He will love them in Black, Bracken and Navy. The father in your life will love the look and feel of these Clarks Northfield shoes which have metal eyelets for the lace-up closure. This makes it easy to adjust the fit while making them secure. The Ortholite footbed can be removed to allow insertion of personalized orthotics. The smooth synthetic lining keeps them dry on his feet and increases the comfort. The durable man-made sole is shock absorbent as well as durable. This shoe comes in Black or Brown. You will love seeing the look on his face when you give him one or more of these great shoes for Father’s Day! As the snowy weather clears up and temperatures start to rise, the Clarks Unstructured Collection offers a selection of shoes and sandals that help you maintain optimal comfort while taking advantage of better weather. Featuring the Unstructured Air Circulation System, footwear from the Clarks Unstructured Collection contains mesh channels within the shoe that pushes out warm, moist air and pulls in fresh outside air. Feet can experience a fresh in-shoe climate that prevent them from feeling hot heading into spring and summer, and reduces sweat and inner shoe moisture that can cause odours and foot friction that leads to blisters. Walking On A Cloud presents a beautiful offering of men’s and women’s dress and casual shoes and sandals from the Unstructured Collection that are sure to feel as great as they look.